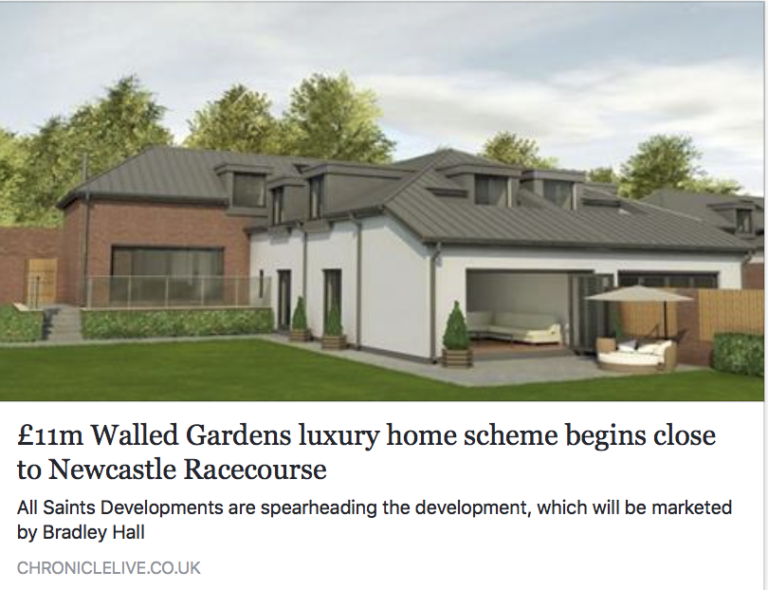 The millionaire houses currently under construction by Gosforth Park Hotel are set to have sedum grass and zinc roofs, ‘to mirror the leafy surroundings and former greenhouses of the Walled Gardens’. When the application was submitted, more than 1,500 people signed a petition against the plans. The houses would constitute inappropriate development in the green belt, would harm local wildlife populations, the historic landscape and result in the closure of two long-standing local businesses. Newcastle City Council approved the plans on the grounds that ‘special circumstances’ outweighed the harm. Officers referred to this application when recommending the planning committee to vote in favour of the Woolsington Hall application. Whether millionaires will choose to live in such a location, surrounded by sprawling development and traffic congestion, remains to be seen. Apparently new residents will have access to ‘a range of restaurants, pubs and retailers on Gosforth High Street’ and ‘excellent transport links’. The area is poorly served by buses and there are no proposals for improved public transport to accommodate the multitudes of new housing developments to the north of the city. Given the number of garages and parking areas in the scheme, it is unlikely public transport will be a feature in these millionaire lifestyles. Yet another example of Newcastle City Coucnil’s short sightedness and willingness to sacrifice green belt, wildlife and local business to accommodate wealthy developers.